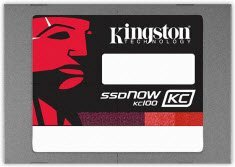 Kingston introduced the SSDNow KC100, a new SATA 6Gbps business SSD with a SandForce controller and 5-year warranty. The disk is available in 120GB, 240GB and 480GB capacities for $337, $650 and $1,270. Kingston Digital, Inc., the Flash memory affiliate of Kingston Technology Company, Inc., the independent world leader in memory products, today announced it is shipping the SSDNow KC100, the company’s first SATA Rev. 3.0 (6Gb/s) business-equipped SSD. KC100 utilizes the latest award-winning SandForce® controller. This powerhouse SSD delivers exceptional performance and instantly boosts the productivity of any client system. KC100 is backed by a five-year warranty to match the industry average for product refresh cycles in the enterprise. Utilizing SandForce’s DuraClass™ technology, KC100 delivers world-class data integrity protection. Corporations can rest assured their data is safe as the drive offers advanced wear leveling and garbage collection to maintain optimal endurance and performance. Data integrity protection runs transparently in the background so it never disrupts daily business. KC100 is the only business-equipped SSD to offer enterprise-level S.M.A.R.T attributes. The SSD’s usage statistics, health and life stage can be monitored with industry standard and publicly available S.M.A.R.T monitoring tools. This provides peace of mind for IT departments knowing their employees are taken care of as the KC100 client-side SSDs are reliable and running optimally. The new KC100 self-encrypts to provide full and immediate client-level data encryption. With two embedded encryption engines, running in both AES-128 and AES-256, encryption is performed at the drive level without draining host system resources and slowing down data transfer r ates. KC100 is also backwards-compatible with current SATA 2 systems so investments are future-proofed for the next client system upgrade. SSDNow KC100 ships in 120GB, 240GB and 480GB capacities, as a standalone or as an upgrade bundle kit. It is backed by a five-year warranty, 24/7 tech support and legendary Kingston reliability. For more information visit www.kingston.com.